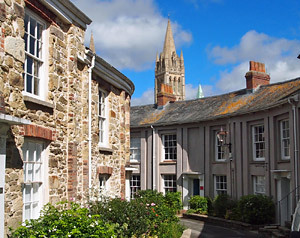 Truro is a historic market town and Cornwall's only city. It is also the administrative centre for the county. The city is blessed with many historic buildings, picturesque gardens and a pleasant shopping centre. Any trip to Cornwall would not be complete without visiting its charming capital. The city's Cathedral, completed in 1910, dominates the town and incorporates part of the older 16th-century parish church. Its tall spires blend well with the surrounding Georgian streets, of which Lemon Street is one of the best preserved examples in England. The Georgian terrace in nearby 'Walsingham Place' is reminiscent of Bath and the old Assembly rooms (located to the North the cathedral) are built of Bath stone and date from 1772. The fine stone Coinage Hall, between Boscawen and Prince's Street, was built in 1848, on the site of the original tin assayer's office. The Truro River, which flows into the Carrick Roads and the Fal, once played a major role in Truro's trade and commerce. Silting-up over the centuries, its usage has been reduced to that of local ferries and pleasure craft. The river trip from the quay down to Falmouth and the Roseland Peninsula is well worth taking if you have the time. 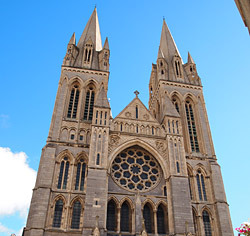 Truro is an important shopping centre for the region, where large national stores mix with antiques dealers, art galleries, potteries and small independent retailers. Plenty cafes and restaurants can be found around the town providing snacks and local delicacies to gourmet meals. Regular markets are held in Lemon Street and Pannier Market, plus a weekly Farmers Market in Lemon Quay. The Truro Festival takes place in Lemon Quay in April and the Great Cornish Food Festival in September, drawing in thousands of visitors each year. Regular daily services and a warm and friendly welcome for everyone. Guided tours available. 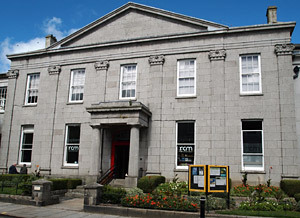 The Royal Cornwall Museum, located in River Street, provides exhibits of Cornish archaeology, geology, wildlife, social history and crafts. There are also examples of English pewter, pottery and porcelain and a fine collection of Cornish minerals. The art gallery displays drawings and paintings by Canaletto, Constable, Gainsborough, Hogarth, Kneller, Lely, Romncy and Rubens and paintings by John Opie (The Cornish Wonder), including many other local artists.